It is the peak of fall migration! 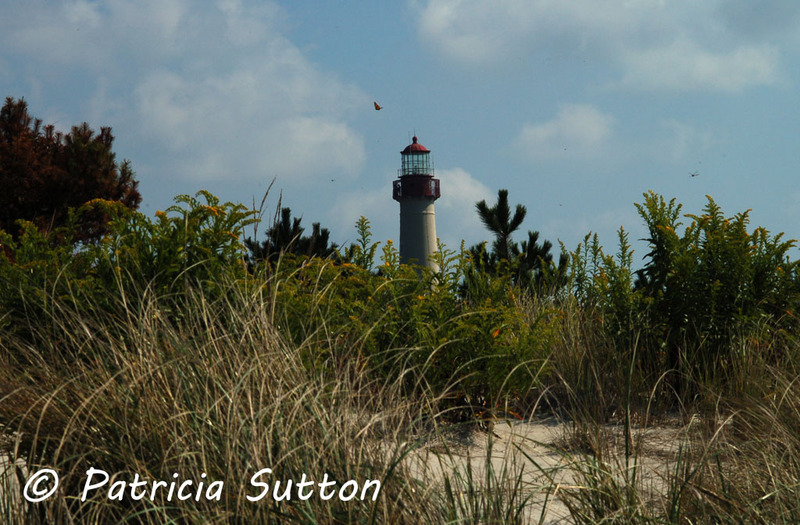 Any time the winds are from the Northwest, you can bet your bippy there will be birds, butterflies, dragonflies, and bats galore migrating through Cape May Point. The Monarchs will continue to migrate through all of October and, if conditions are right, even the first few days or first week of November. October 3rd the winds were gentle from the northwest, perfect for migration, so Clay & I decided to “take our walk” at Cape May Point. We got down there and never left. 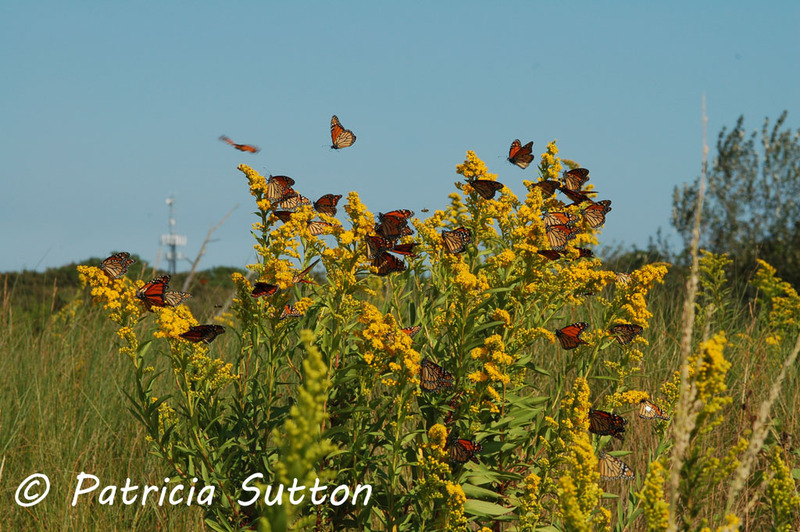 A blizzard of Monarchs on Seaside Goldenrod at Cape May Point, October 3, 2018. A day for the record books! 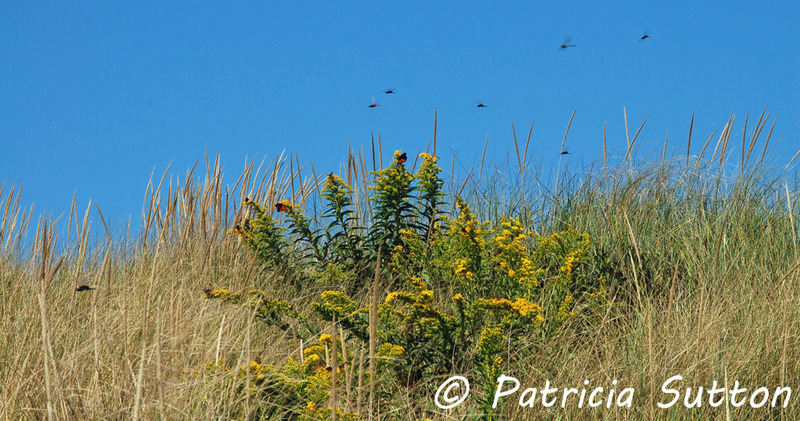 The floodgates opened and a river of Monarchs and dragonflies was flowing down the dune line, right over the dune crossovers in the town of Cape May Point. That was the place to be. 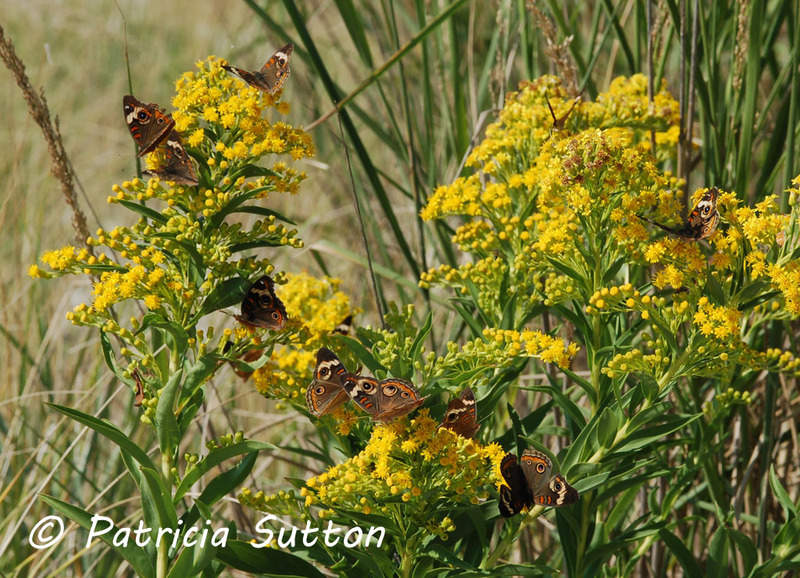 A steady movement of Monarchs floated by while others nectared on the Seaside Goldenrod in the dunes. Some pulses were huge! A steady movement of dragonflies zoomed by including mostly Black Saddlebags and Common Green Darners with some Carolina Saddlebags mixed in (about 1 in every 10 saddlebags). The numbers were uncountable. Thousands upon thousands upon thousands of Monarchs and dragonflies. I’ve included some photos with this post to share with you the spectacle we witnessed on October 3rd, truly a day we’ll remember forever more. 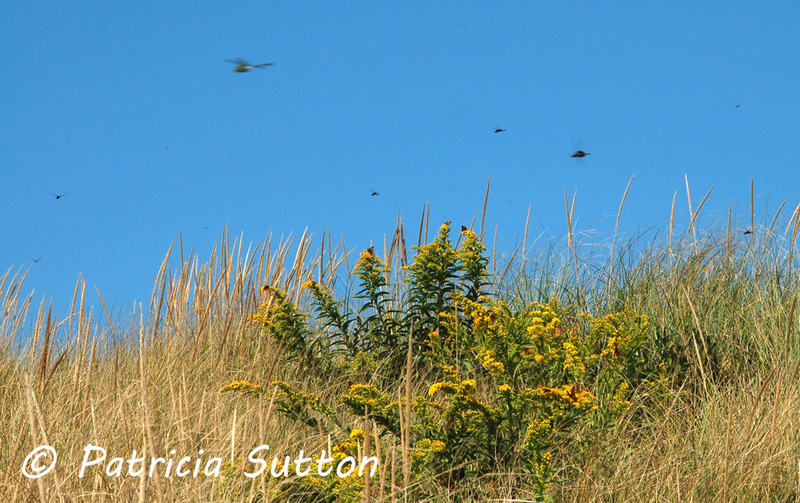 Thousands of Black Saddlebags and Common Green Darners migrating down the Cape May Point dune line over nectaring Monarchs in the Seaside Goldenrod. 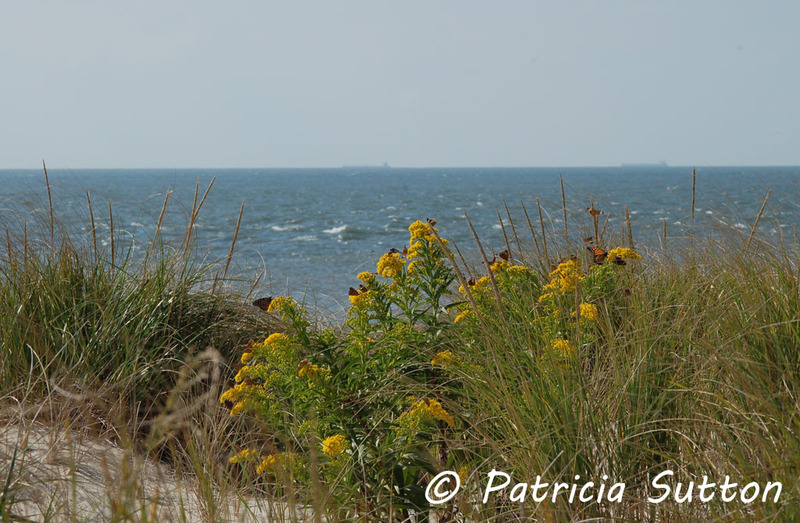 Many Monarchs reach the tip of the Cape May Peninsula on winds like those that blew on October 3rd from the northwest. These winds blow migrating Monarchs out to the coast. Rather than get blown out to sea, they turn and follow the coastline south, and reach lands end, Cape May Point. On days with the right conditions (gentle winds from the northwest), numbers build and build. Sometimes we’re treated to a late afternoon and evening roost where Monarchs gather by the thousands. The next morning can be quite a spectacle, when they are warmed up by the rising sun and lift off to continue their migration. Talking with Mark Garland, who heads up the Cape May Monarch Monitoring Project, he did not expect that there would be a huge roost or roosts of Monarchs the evening of October 3rd in the town of Cape May Point because it was so warm (80 degrees). He shared that those huge roosts usually form in the late afternoon on the colder days when temperatures are 50 degrees or cooler. He thought there would be lots and lots of little Monarch roosts around Cape May Point instead, with 10 Monarchs here and 10 Monarchs there. From what we hear, that was the case. We couldn’t stay that evening to see for ourselves. We headed back down the next day, October 4th to see what was left over from the flight the day before. The winds switched in the night from northwest to south, so we weren’t expecting too much. Indeed the south winds were not bringing new Monarchs to us, but it was a beautiful day for a walk. This fall, respond to weather predictions. If the winds are to come from the north or northwest, get to Cape May Point! Just do it!!! 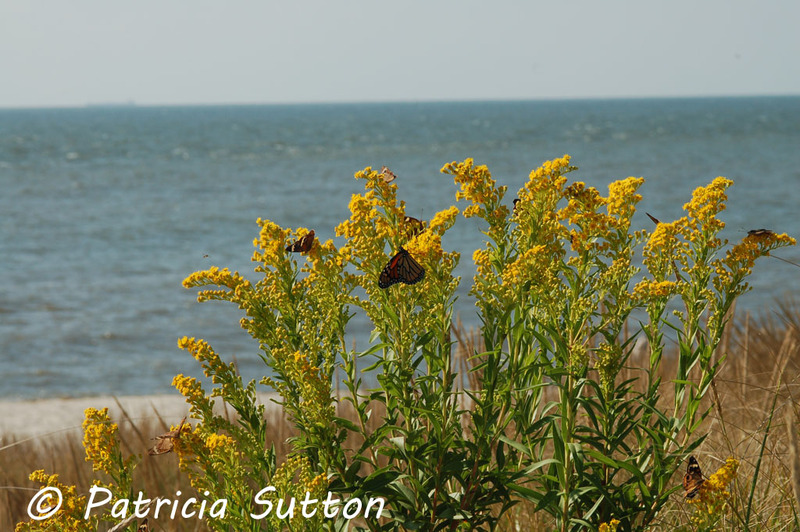 Monarchs nectaring on Seaside Goldenrod with the Delaware Bay beyond. Please don’t flush them for a photo. Their migration is hazardous enough! All these photos were taken on October 3, 2018, from designated trails and dune crossovers in Cape May Point. Please don’t walk up into the dunes for photos. For one thing it is illegal and very poor etiquette. If you should encounter roosts of Monarchs, please do not approach so close that you flush them. Remember that they’re holding on for their lives. The next stop is a big stretch of water and that can be treacherous for Monarchs. 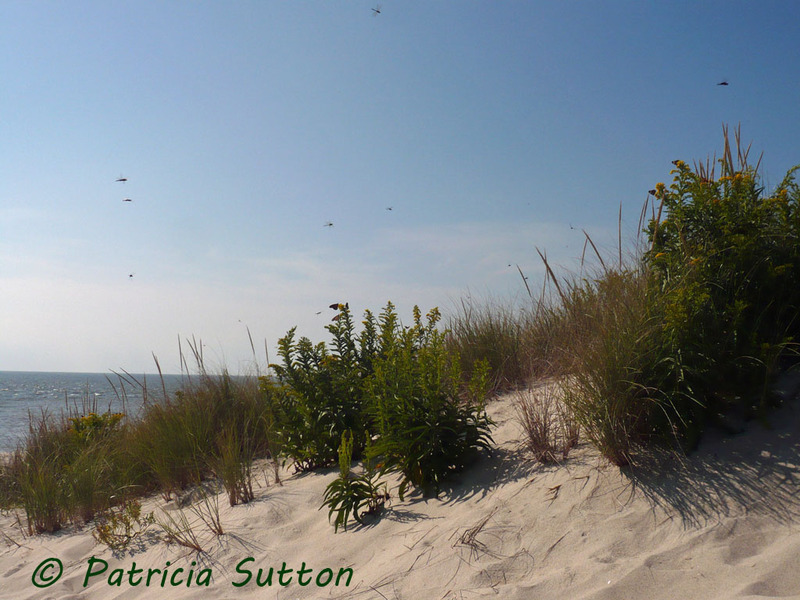 There are many dune crossovers in the town of Cape May Point that take you right next to blooming nectar full of Monarchs. 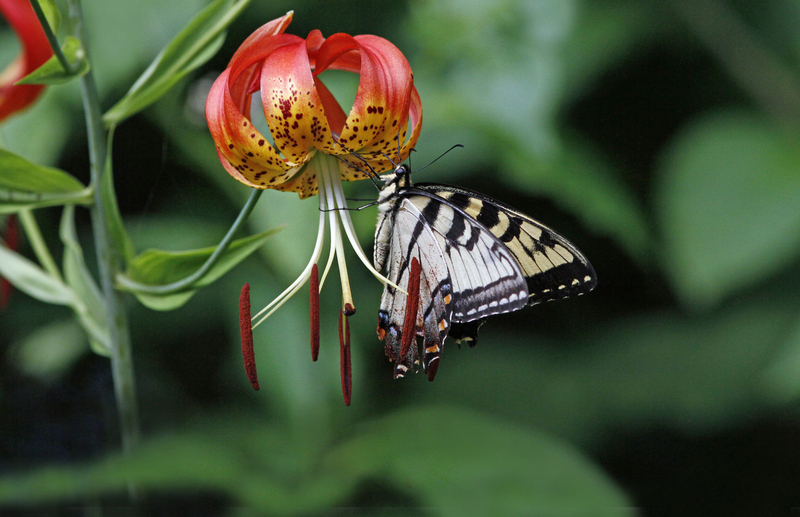 And there are nectar-rich stretches along the dune trails (between the dune and the Plover Ponds) in both the Cape May Point State Park and the South Cape May Meadows. All these sites offer terrific photo opportunities. Please do not leave dune crossovers and trails to venture into dunes for photos; it’s illegal for one thing and disruptive and just poor etiquette. There are also 100s and 100s and 100s of Common Buckeyes nectaring on the Seaside Goldenrod in the dunes at Cape May Point now. I’ve been rejuvenated and given hope, having seen this mega flight. May you too connect with one of the Monarch flights this fall. Very nice! We’ve had a steady stream of monarchs through the yard the past couple weeks. With several in view as I type. Thanks for sharing those inspiring photos and words! I will be sure to check wind direction more closely now! I wish we had known that you and your husband were there at the Cape May Point on October 3rd. We were there too. 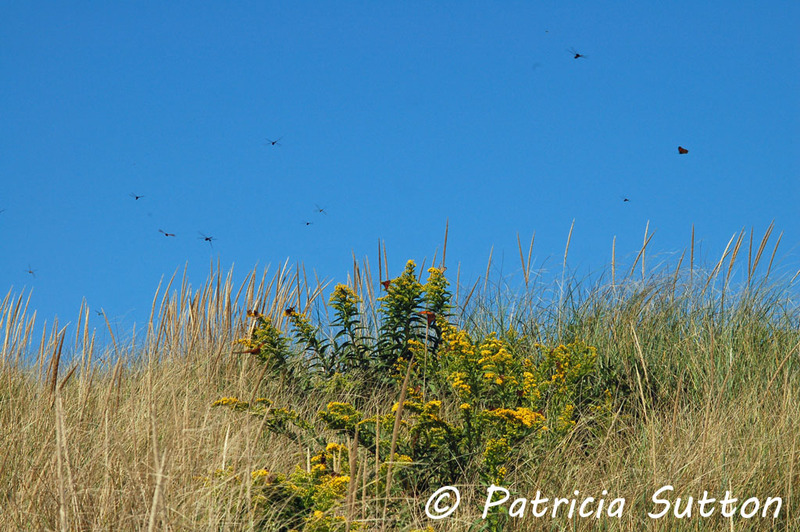 It was glorifying to see so many Monarchs happily flying around the dunes, parking lot and on the trails by the light house. We were able to share our Monarch “expertise” with many people we met. So we pray that more and more will grow milkweed and draw in Monarchs in the future. This seemed to be a very good year. Our best friends have a memorial garden in honor of the son they lost 12 years ago. They raise and release Monarchs each year. No tagging. This year they released over 1400 butterflies. We hoped that some of what we saw passing Cape May were theirs. Hi Debra, You and I are the lucky ones to have been there that day. Pure magic. Yes, there can’t be enough milkweed. Those of us with pollinator gardens including as many different milkweed patches as we can tuck in, certainly played a role in that magnificent flight on October 3, 2018. 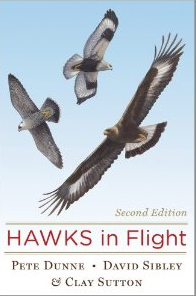 May there be additional flights this fall to dazzle others and nudge them towards the importance of wildlife gardening.